Defensive Handgun 1 is the first stage of your advanced training to become more confident and proficient with your shooting skills. This class will refresh and build on good shooting fundamentals, focusing on trigger control and aiming for self-defensive training. Instructors will cover ways to dress for concealed carry, holster options, as well as the process of drawing from a holster. When finished with the class, students will be holster certified, allowing them to practice drawing from a holster when on the range at AimHi. Ready to sign up? 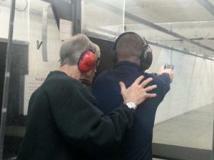 Click here to see all of our Defensive Handgun 1 classes.